Whatever your opinion of Katie Hopkins, surely you would never and could never feel so strongly that you’d wish to kill her? Right? But, then, what if somebody did? How would you, or the world respond? 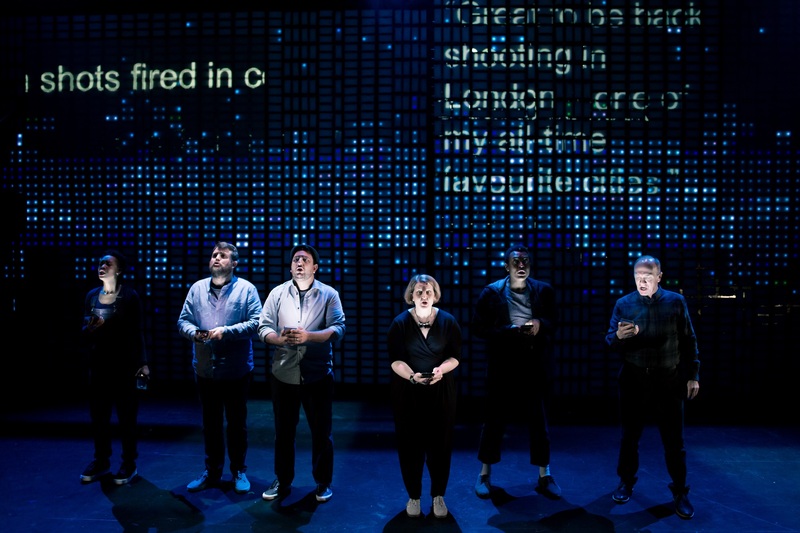 Theatr Clwyd’s most recent musical, the Assassination of Katie Hopkins takes us on that weird ride and makes you question everything you think you know about the media. Ultimately, what would you do? Theatr Clwyd’s most recent performance, The Assassination of Katie Hopkins, has left our James Wright reeling from the fears and threats of online journalism. Let’s hope he breaks out of that sooner rather than later! Another glorious trip to Theatr Clwyd has left me pondering so many things. What is real? Does anything we do really matter? Can we trust those the media? It seems a weird way to open a review, but Theatr Clwyd’s most recent – and some might say, most powerful and timely – performance has so much social commentary going on that my mind was racing all night. High praise, but The Assassination of Katie Hopkins deserves it. Set in the near future (June, this year), during the BME awards ceremony in London, a devastating crime shakes the very core of Britain. A crime that nobody owns up to, but wherein everyone could be a culprit – somebody has shot and (spoiler alert!) killed Katie Hopkins. But, therein lies the start of the tumultuous path that this new Britain sans Hopkins finds itself going down; Scotland celebrates on the streets, riots flare up across the country, and everyone online has an opinion. And it’s that last part that holds the most water with me – being somebody in this world means nothing if you haven’t got a voice, you don’t have anything. We find a safety blanket in the anonymity of our keyboards, where we can post anything anywhere with a false identity, and then, for the most part, we can take solace in the fact that we are protected by Free Speech. But so is…was Katie Hopkins. The responsibility the media takes for giving somebody like Katie Hopkins a voice needs to be taken into consideration, for without such platforms as LBC radio or the likes, people like Hopkins wouldn’t have been able to reach an audience. Unless, of course, you take social media into account. So, as you can probably surmise, the musical is much more than just a satire about ‘wouldn’t it be funny if Katie Hopkins was killed?’ and more a social commentary as media consumers within the digital age. As the play so eloquently displays, we are [basically] connected to our smartphones, and anytime we see a new notification we have to check out what it is, regardless of whether we’re in an interview, a meeting or sat with friends or family. It becomes a powerful and isolating place to find yourselves, but as we devour more and more news and content, and more and more people become journalists or, at least, people with a voice and an opinion, the trend only increases. I sit here and I acknowledge the irony of that paragraph. However, the musical plays heavily on another trend within the media, one that is far more fundamentally detrimental to ourselves as a species. Whilst the ensuing chaos and controversy surrounding Katie Hopkins’ demise is repeatedly reported on and discussed by national TV professional journalists and YouTube creators alike, another story plays second fiddle. An unfortunate accident occurs on the same day as Hopkins’s assassination, and, as the world’s media cover that exponentially, the accident goes along, unnoticed by an apathetic generation who, without the mantle of celebrity to cling onto, simply don’t care. The musical score (which, you’d imagine, would be quite important within a musical performance) is techno-cool and internet age appropriate; the tannoy during intervals features annoyingly familiar sound effects that you’d associate with social media brands, such as a new Tweet coming through or a new Facebook message being sent. It plays out above the audience, who, unsurprisingly, don’t seem to find it out of place. Why would they? We’ve all been programmed to think that these unnatural sounds are normal, after all. And the musical’s score itself is appropriate and timely, with electronic influences coming from bands such as New Order to Daft Punk. The singing – especially by lead roles Maimuna Memon and Bethzienna Williams (whom fans may know from BBC’s Casualty and Our Girl) – deliver enough raw power and talent behind them that, at times, they probably wouldn’t even need a musical accompaniment behind them. The fact that there is one just makes the whole thing that much better. Aside from the aforementioned Williams, each of the cast has certified stage credentials going for them, with Amy Booth-Steel, Rakesh Boury, Derek Hutchinson, Matthew Woodyatt and Genesis Lynea appearing in no fewer than 35 different stage performances between them and a number of TV and film credits to boot. Ché Francis recently graduated from LAMDA, which, in itself, is a worthy career highlight. The cast, under the guidance of director James Grieve with words by Chris Bush, manages to bring multi-culturalism and powerfully emotive realism to the performance from start to finish. During one scene in the second half, Maimuna Memon’s character is verbally and racially assaulted on the tube. The acting and sense of realism on display was difficult to watch but was something that needed to be portrayed. Thankfully, it was handled as well as you’d imagine the cast and crew could do. The stage – often the unheralded biggest support in any performance – which is built up with thousands of phone-sized LED lights, is used to great effect throughout and adds an excellent touch of technological savviness to the performance. Image courtesy Sam Taylor. Pictured; Ché Francis (background), Genesis Lynea. The underlying themes of racism, freedom of speech, and cultural responsibilities are, perhaps, much more prominent in The Assassination of Katie Hopkins than some more ‘traditional’ performances, and I think that may have something to do with the familiarity of Katie Hopkins itself. Whilst a play by Shakespeare might resonate the same themes (give or take), this musical makes us all feel very much a part of the discussion. And that’s arguably because it unfolds on very familiar platforms, whether they be Twitter, YouTube, BBC, the radio, or whatever. It’s that sense of connection to the musical’s setting that makes it seem much more poignant. And, whilst it wasn’t completely planned (at least, I don’t think it was) by Theatr Clwyd, there was an additional bit of viral campaign going on during the intermission as an advertisement truck was parked outside the theatre detailing how “if we wanted to know the other side of the story (that would be about Katie Hopkins and how she shouldn’t be despised and ridiculed as such just for being an outspoken, confident, white, Christian, Conservative woman) we should check out HopkinsWorld.com” and “what would you say if there was a musical titled ‘The Assassination of Sadiq Khan’” (Sadiq being the Muslim Mayor of London whom Hopkins has made very public comments about in the past). At first, I didn’t believe that these sites (HopkinsWorld.com and TheRebel.media) were real, but upon further research, they very much are real, and if you would like to support either The Rebel or Hopkins herself, you can donate towards the £2,000 to cover the cost of running the advertisement truck around North Wales and London during The Assassination’s stay at Theatr Clwyd. What do you mean you won’t? We Are Chester Final Thoughts: I’m an easy sell most of the time when it comes to plays (or musicals) at Theatr Clwyd. The location is wonderful (and closeby my Penyffordd home) and the services are excellent. I’ve never not had a good time at Theatr Clwyd, but this may have been my best time yet! The Assassination of Katie Hopkins delivers from start to end, with amazing talent from the actors and musicians alike. There isn’t a single moment where I thought ‘how long until it’s over?’, and, in fact, I was left contemplating and musing over the messages the musical laid out for me. As a member of this online media community, it resonated hard deep inside me, and it’s left me equal parts fearful about the community and optimistic that, at the very least, it provides people like you and I a voice wherein we can be heard. Well done James Grieve and Chris Bush for making me doubt and celebrate myself all in one go!